The BD FACSymphony class of instruments are SORP (Special Order Research Products) flow cytometers equipped with 5 lasers and designed to generate data of up to 30 parameters for each cell. The BIOASTER Immunomonitoring facility in Lyon is hosting one of the three Symphony available in France. This flow cytometer currently allows analyzing up to 25 parameters per cells in our facility with more to come as new dyes are being developed. We can therefore provide investigators with high dimensional analysis including phenotyping and functions of discrete cell populations. With 5 lasers and 29 detectors, a major asset of our FACS Symphony is also the capacity to design 15 to 20-parameter panels with unpreceded ease. 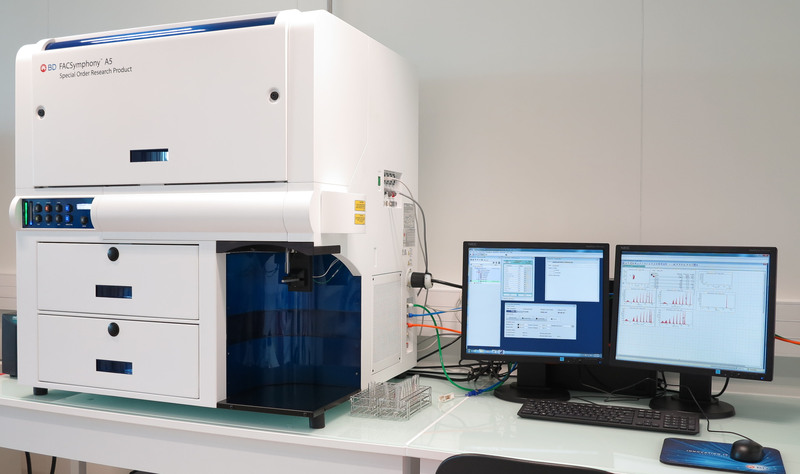 It is also equipped to take the High Throughput Sampler (HTS) for 96 well type plates. with private and public partners, for global health issues.